I’ve had the pleasure and the honor of living in Japan on three separate occasions: Twice in high school for summer-vacation homestays in Hiroshima, and once in college for my junior year in an apartment in Kyoto. I kept extensive journals of my time over there, and I sent the majority of the content of those journals home to family and friends in the form of weekly e-mails. Most of what I wrote was less than riveting, but there are a few stories that stand out in my mind as worth telling again. Some of them, like the following story, have never been written down before. This is the Hayaben Story. Japanese kids go to school year round, so when I had my first homestay in Hiroshima in June (a dreary, rainy month in Japan—never go in June or July)—I attended high school classes every day. I had only been studying Japanese for a few years, so I didn’t understand most of what the teacher was saying. I spent the majority of my time observing the odd behavior of my classmates. You’d think that Japanese kids would be polite and respectful in class, carefully recording every word the sensei said, never speaking out of turn. That’s not the case at all, or at least it wasn’t at Johoku High School. The kids basically did whatever they wanted during class. The real school started in the evening, when they’d bury their heads in books to study for entrance exams. The best part of class was lunch. The kids would wolf down their food and then leave the classroom to walk around the complex, buying treats and socializing with other students. I always looked forward to the break from the drudgery of class, and it was fun to talk to the other students at that time. However, as noted before, I’m an extremely slow eater. It usually took me most of lunch to finish my bento box, a little compartmentalized box of food that my host mother prepared for me every day. This left little time for socializing. “Yes!” I thought. “Look at me! I’m so fast! 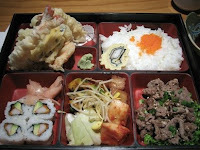 So fast!” I continued shoving food in my mouth at an alarming rate, my chopsticks twittering away like quilting needles. It wasn’t long before I looked around and noticed something odd. No one else was eating. No one else even had their lunch out. At first I thought that there was some reason everyone wasn’t eating, like it was National Happy Free Lunch day or something. But that wasn’t the case. It simply wasn’t lunch time. I learned my lesson. From that day on, I waited until the other students pulled out their lunch before I did the same. I’m sure those kids forgot about the incident by the next day, but I still remember the day I ate lunch so fast. And so early. This entry was posted on Tuesday, June 17th, 2008 at 11:05 pm	and is filed under Japan. You can follow any responses to this entry through the RSS 2.0 feed.